The Lunar Achilles Express ultrasonometer is a compact, cost-effective solution for evaluating risk of osteoporotic fracture. Its low precision error makes it suitable to monitor bone changes, such as those associated with disease progression or response to therapy. The system measures the ultrasound properties of the heel, which unlike the forearm or hand, is load-bearing and highly trabecular. It indicates risk of osteoporotic fracture comparably to femur and spine dual-energy x-ray absorptiometry (DEXA). The Lunar Achilles Express is proven to indicate fracture risk in the key group of women 45-75 years as well as older women. 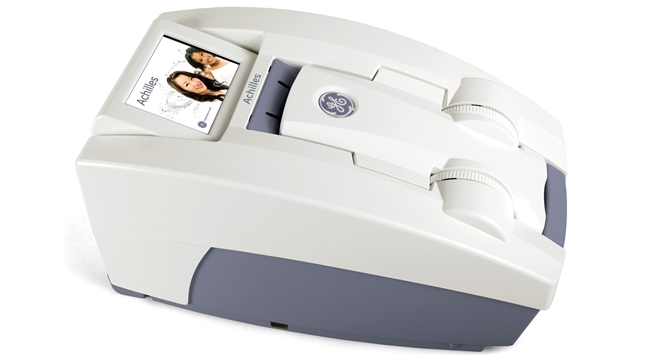 Click the button below to add the GE Achilles Express Ultrasonometer to your wish list.